Things may be progressing quicker than I thought possible for a vertical sleeve gastrectomy, thank you, medical tourism. (Not sure why I'd have this surgery? Read here.) With a potential DECEMBER date on the table (gasp! faint! ), I'm trying to figure out, logistically, if I can make this happen, and more importantly, if I am emotionally and physically ready for it to happen. My gut is telling me I am, and it is surprising me. With that in mind, on the way from school to Girl Scout drop-off today, I chatted with the kiddo about how me flying out of town to get surgery might look and feel, and to get her thoughts. Time in the car can be our best discussion time, and I try to capitalize on it without exploiting it. I talked about how my diet will be changing, permanently, and how I will need to do a temporary liquid diet both before and after surgery. I told her it might be hard for me to make meals for her and her dad while I am only drinking protein shakes and broth, but I will do my best. Then I suggested that once I start eating again, some of the things I make might have to change. I'll need more protein and vegetables, and less starchy foods, like pasta, bread or rice. She replied, "We don't eat much of that stuff, anyway," which is true. I asked her if she was worried about the surgery. Nope. "I don't want to stop having Taco Tuesday. I love Taco Tuesdays!" It's about priorities, people. TACO TUESDAY. After I told her Taco Tuesdays are still fine, she snapped out of it, suggesting that I don't serve pasta, bread or rice with tacos, anyway, and I could probably just skip the tortillas. "Good thinking," I told her. A few minutes went by, listening to the radio, then she jumped back in, answering my earlier question. "I'm not worried about the rest of the stuff. I won't mind if you get skinnier." I told her that I wouldn't mind, either, and how I really wanted to feel better and be able to do more things with her, and a smaller body would make that more possible. Then she started getting sniffly again, this time in a quieter, more private way. I asked again, "Are you okay, EJ?" "Yes, I won't mind if you get skinnier, but Mom, I'm really going to miss hugging you with my whole body. I'm going to miss the body you have now. I love it." Gulp. I started pushing back tears, grateful that we weren't facing each other, and said, "You will never, ever need to stop holding me with your whole body, no matter how big or small this body is, I promise." We both cried some more. It was a muted sobfest heading up northbound Lakeshore Drive. I broke the weepiness by saying, "When you were a baby, I could snuggle you like a baby. Now you are a girl, and I can hug you like a big kid. Sometimes I miss what it feels like to snuggle my baby, but then I hug you, and you are the same person as that baby, and I love you as you are right now, so I don't miss it anymore. Bodies change, but people are who they are." "Still, I will miss you in this body, Mom, just how it feels when I hug it. I will also miss your giant feet." "Well, my feet won't change size," I told her. "Whew. That is a relief." That my kid loves me as I am as a person isn't surprising, but it is lovely to hear. 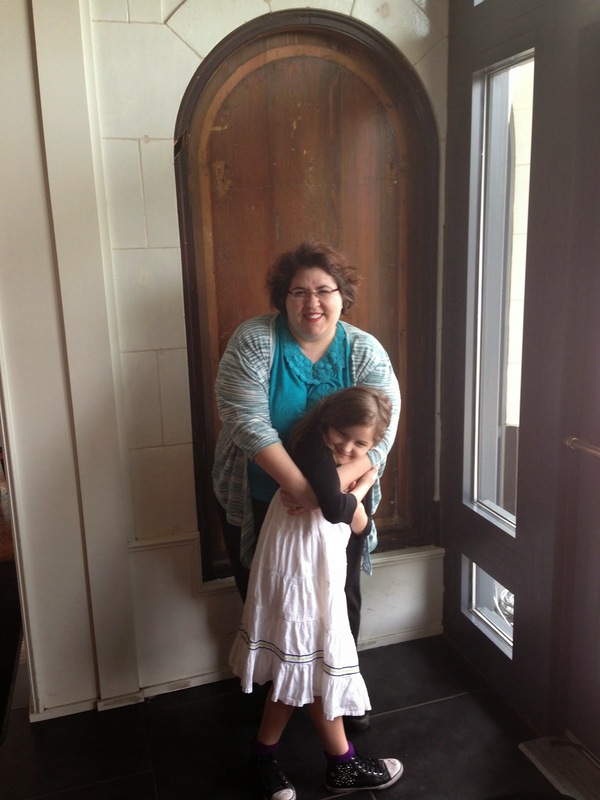 That my kid loves me as I am as a body, with all of my extra inches, humbles me beyond belief. Ah, what a sweet, sweet girl. Oh, my heart just broke and mended all at once. What a lovely girl Ellerie is, and what a wonderful mom you are to her.